Owen Hart was taken from us far too soon after a tragic accident in 1999 at the Over The Edge pay-per-view. It was a terrible time for pro wrestling and his funeral was attended by a who’s who in WWE. One fan claims that he has been able to come into ownership of an actual program from Owen Hart’s funeral service. He posted on a wrestling memorabilia page on Facebook to put this item up for sale. 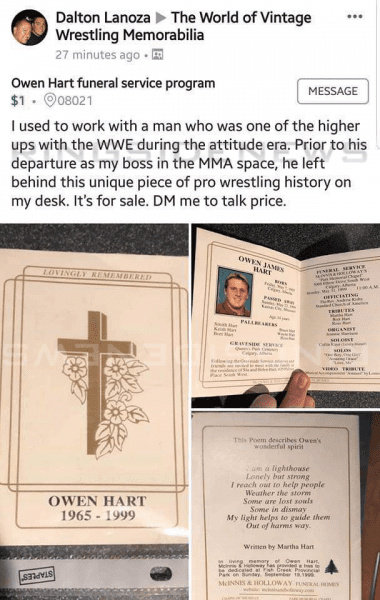 The best idea if you’re interested at this point is to message the seller and just see what he’s asking if you’re looking to add Owen Hart’s funeral program to your collection.